Home Beyond the BorderAustralia	My Melbourne Musings: Marvellous is the Word! What’s your reason for falling in love with Melbourne, the most livable city in the world? Melbourne has been on my mind ever since Tourism Victoria posed this question to us bloggers. The city has been ranked the world’s most livable city since 2011, and that I believe gives a lot away about how marvellous a place it is. Also, my first cousin lives in Melbourne and every time we talk he cannot rave enough about the good life he’s living there. And since he knows about my passion for travel and travel writing, time and again I keep getting an invitation to visit him there and experience first-hand not just the popular and much talked about places, but also the hidden treasures that only the locals know about – buildings with gripping stories behind them, the many architectural marvels, the tram sessions, the many alleyways laden with intriguing street art, the quaint cafes and yes, the delightfully engaging street performers in the relatively less populated streets of the city! I had fallen in love with Melbourne long, long ago, with my cousin shifting base there and regaling me with engrossing titbits about the city, and with the passing of time, this one sided romance has only grown deeper. Hopefully someday I will be there and write first-hand stories about my experiences there. For now I can only write about all the enthralling delights that have made me fall in love with this marvellous city! There’s so much to explore and experience in Melbourne that a history, architecture, culture, et al junkie like me is spoilt for choices! And the stunning landscape and the bountiful of wildlife! One would want to come back here again and again! So here we go! Here are my REASONS for FALLING IN LOVE with Melbourne! 1. The Spectacularly Splendid Landscape! Ah, the abundant parks and gardens of Melbourne! No wonder the city is considered Australia’s Garden City! 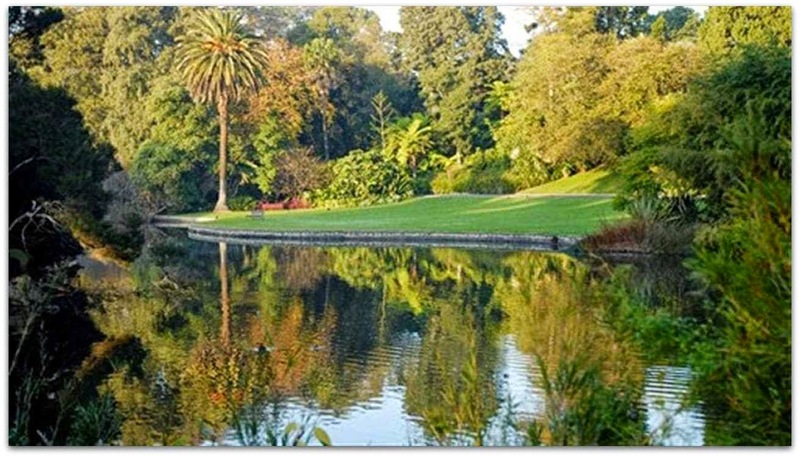 The world wide web is full of beautiful photos of the stunning landscaped gardens and parks that the city boasts of. The Royal Botanic Gardens, Flagstaff Gardens, the Fitzroy Gardens, the Carlton Gardens – oh, one can go on and on singing paeans about the incredible variety of plants and trees they boast of, the intricate fountains they are dotted with and the lovely buildings that so beautifully blend with the abundant greenery all around. And this is one reason why the outdoors-loving me cannot help but fall in the love with this city! I can imagine myself strolling around the cobbled pathways in the garden, marvelling at the well maintained extensive lawns, the trees, the flower-beds, the greenery! And a relaxed picnic lunch at any of these gardens would definitely figure in my itinerary whenever I land in this city! while the Carlton Gardens is listed as World Heritage Site. 2. The Thriving Art Scene! There’s another winner here! Guess what! Melbourne is known as one of the world’s great street art capitals! And indeed Melbourne’s street art is legendary. Stencils, sticker art, Wood-blocking, murals, paste-ups, poster art, graphs, street installations et al, you will find everything here! And street artists’ intriguing self expression has found place on many of city’s alleys and lane-ways! The art-lover me would be more than happy to gaze at all the wonderful depictions of the streets across the city, interpreting and re-interpreting them at length. And I’ve learnt that the best place in the city to do this is the famous Hosier Lane. This cobbled pedestrian lane-way is noted for complex street art and installations, and thanks to the internationally acclaimed art display here, it is one of the most photographed streets in Melbourne! And here’s a video of the famous street! When Tanmay and Rohan of Melbourne Escapade fame visited this landmark street, guess which Indian personality they found on the walls there! Guess, guess! Never mind if you fail, for the answer will cheer you up! and the first stencil festival in the world was held here in 2004! 3. The Culture Conscious Crowd! Garden City. Art City. Culture City. Yes, you read the last one right. Melbourne is ALSO referred to as Australia’s cultural capital. With so much greenery, art and cultural happening, one can understand why the city has been ranked the ‘most livable city’ year after year after year! 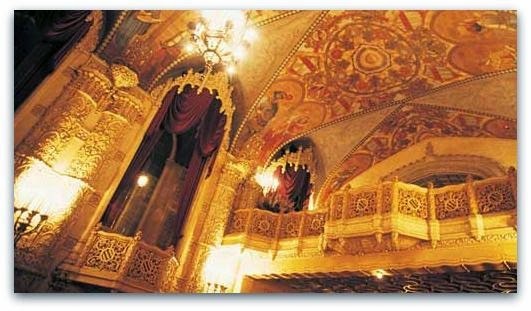 The city is home to world-class arts and cultural heritage institutions. National Gallery of Victoria, Australian Centre for the Moving Image, the Melbourne Museum, and the Royal Exhibition Building are just some of the contributors to it’s claim to cultural fame. Add to it the many theatrical performances, the art shows, the musicals, grand films, the themed performances…reason enough to make me fall deeper in love with the city! I will keep hopping from the museum to some gallery, and from gallery to some other exhibition, and from there to some theatre. Talk about idyllic life, ha! and the Melbourne Shuffle, that originated in late 1980s. 4. The Cafes and Coffee Shops! Since this post has now turned into the many ‘CAPITALS’ that Melbourne is about, how can I miss coffee! We all know Melbourne is the Coffee Capital of Australia and now vying for the world title, if I may add so! So it’s no surprise that the city has a plethora of cafes and coffee shops doting its lanes and by-lanes. The coffee-lover-me will have a gala time here, discovering quaint cafes, sampling coffee across the many independent coffee shops and spending some quality laid-back time here. And adding some glamour to the coffee ritual would be checking out those very popular coffee shops listed in the guidebooks – the funky Baba Brother Budan and the historic Pellegrini’s Espresso Bar! 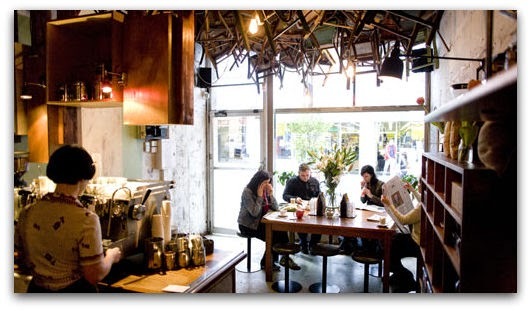 The famous Brother Baba Budan Coffee Shop! a mountain range in the Chikkamagaluru district in Karanataka. 5. The Tram Rides & Tram Sessions! Before I share the fun details about Melbourne tram sessions, let me not miss the chance to share the city’s another claim to fame – Melbourne has the world’s largest tram network! As of May 2014, this network consisted of 250 kms of track, 493 trams, 25 routes and 1763 tram stops. These are Wikipedia figures and am sure this figure has only increased in the year gone by! Now about the tram sessions! Tram sessions is basically a not-for-profit project that helps make commuting pleasurable, promoting locals artists and free live music on trams and later uploading the videos on YouTube. Now I am already imagining what fun it would be to be sitting on one of the trams there, and there starts an impromptu gig, making my journey musical! Imagine, the romance behind the idea! Tram Trivia: Melbourne’s first tram was a horse tram from Fairfield Railway Station to a real estate development in Thornbury. It opened on 20 December 1884, and was closed by 1890. It’s these big and small things that make Melbourne beautiful for me. I have never been to this city, but the good word from my brother convinces me that the city indeed is one of the most coveted one to live in. And the many articulate pieces written about the city, both online and offline, only confirms it’s big claim to fame. While the reasons I have listed about are quintessential to Melbourne, the traveller in me cannot admire and appreciate enough the many travel delights around Melbourne. Panorama shot of Loch Ard Gorge Beach! Exploring the Great Ocean Road – Take in the coastal scenery, walk the coastal route, marvel at the iconic 12 apostles, surf, scuba dive, explore the rugged beaches and the shipwrecks, spend some time at the Loch Ard Gorge Beach. basically do everything that is there to do! Exploring the Yarra Valley – Live a life of indulgence! Basically eat, drink and be merry. Learn more about the regions art history, wander around the lush valley, savour the fine wines, and of course, take a balloon ride above the Yarra valley! Live the good life basically! Exploring Phillip Island – Chocolate and Penguins, two things that can make any girl go mush! And this incredible island has both! The Chocolate Factory here is a must visit – for it celebrates chocolate! And then there are little penguins who parade, much to the visitors’ delight! Here’s a video of Tanmay and Rohan building houses for the little ones and having a fun time watch them race to the shore! After watching the video, I am so inspired to go to Phillip Island and try my hand at building little penguin nests! Post your answers in the comment box and cross your fingers! Remember, the last date to answer the contest question is January 5! Hope you do go soon! Enough reasons to fall in love with the city. Nice post! 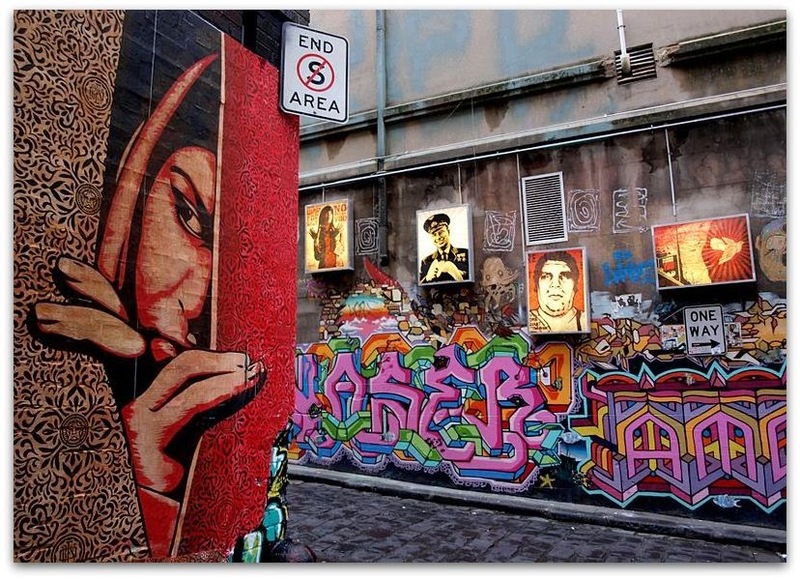 As I am an art lover and artist, I would love to visit Hosier lane. It intrigues me. Very nice post Ragini. May you win. Great post! After reading your post & watching all the videos, I'd most like to visit the Dandenong Ranges for it's scenic beauty, breathtaking view and cool breeze blowing through my hair. 😛 I'd give anything away for driving through the winding roads which are present throughout the ranges. I'd love to stay at one of the bed and breakfast cottages and go on frequent excursions in the forests with my camera which provides excellent views. And not to forget the famous ride in the Puffing Billy, a day reserved especially for that. To add to that, there are also several picnic spots for me and my friends to spend a fun-filled day and the ranges are a perfect spot for hiking and cycling. Chocolates!! I share your sentiments here, Uttpal! And the Chocolate Factory is the sweetest attraction on Phillip Island. Great choice! Best of luck for the contest! Thank you! There's so much more to Melbourne than what's listed here! There's no place that would be better for me to visit than The Thriving Art Scene! Art is something I love and adore, be it of any kind. All artworks have a piece of the soul of the artist who created it with so much love! It's something which cannot be explained in words, but the whole feel and aura of such places is magical! The place looks so beautiful, bold and yet so peaceful. I mean isn't it amazing how you can turn old walls into something so flamboyant, vivid and stunning using just some colors and your own imagination? Such things are meant to be devoured by the eyes and soul. I wanna go to the Phillip Island to meet the Penguins. What fun it would be to build little penguin nests! Wow Ragini, your post has got me daydreaming about Melbourne now! The city definitely figures on the top of my 2015 travel wishlist! Best civic amenities, great people, cool atmosphere, greenery, the many architectural delights, the historical monuments…the city has so much to offer! And of course its coffee houses! Would love to spend some quality time exploring the city! Once again, congratulations on writing such a detailed piece on Melbourne! Marvellous indeed! Once I am in Melbourne, I will make sure that I explore every nook and corner of the city, but if paucity of time plays spoilsport and I have to pick from amongst the many touristy delights in and around Melbourne, then I will make sure that I explore the Great Ocean Road! A visit to Melbourne would be incomplete without exploring this famous coastal road and marvelling at the iconic 12 apostles! This post has left me awestruck. Added it to the 'to-travel' list. The most interesting part is the coffee trivia that you shared. What fin would it be to sip desi coffee with an international touch at such a pretty place. Talk to new people and find about their life, this can surely be an inspiration for my next book. Good luck for the contest and Happy New Year. I'm most inspired by the hot air balloon rides. Floating along above the vineyards, the photo ops would be fabulous. 'Melbourne ' the fine blend of nature's splendid beauty and human aestheticism ,can't be left unexplored ! Serenity of Loch Ard Gorge Beach , thrill in Great Ocean Road ,spell of Regent Theatre , taste of Brother Baba Budan Coffee Shop, art of Hosier Lane..nothing can be left unattended . Lastly how can one forget to enjoy the ride of tram and parade of penguins ? And Hosier Lane is an interesting choice! It figures in my Melbourne must-see list too. Great post! After reading your post & watching all the videos, I would definitely want to visit all those amazing places when I get to visit Melbourne 🙂 But of all, my top pick would be a visit to Yarra valley for a beautiful sunrise balloon flight. After seeing the video, I can't stop myself from dreaming a romantic magical flight above the scenic vineyards and watching the sunrise from up above! Throw in my favorite wine, I will doubly enjoy the ride sipping my glass and taking sensational selfies all the way 🙂 Now I can't think of a better way of spending a vacation!! Thanks cruxrebels! Dandenong Ranges is a great choice indeed – lush forests, quaint villages, and the icing on the cake, a ride on the historic Puffing Billy! Wish we all get to live this dream sometime soon! Thanks Poonam. Glad you enjoyed the post. Melbourne has everything to keep us wanderers and wonderes occupied. Thanks for your comment Poonam! And once again, thank you so much for appreciating this post on Melbourne. Hey ,Superb post ,so all set to pack bags to have a thrill at Melbourne…Now being high on my wish list:)U’ve very well covered "the best of Melbourne" & for the entry in contest ,there cannot ever be a single place for me..It has to be a bouquet of places to feel calm down my zest to explore it..So naming ,first comes the Great Ocean road not just to linger or have a decent walk but to amaze myself with Jetskiing ,Scuba diving & to try swim with Dolphins & seal! Yay ! these b’ful creatures would be lucky to share a swim with me;) .Then it would be "Eureka Sky deck, to have an awe inspiring experience to be closest to sky & get the sky deck view of this liveable city & MCG to watch & cheer the players on one of the worlds best cricket ground! Wishing u Best of Luck & a great year ahead!! Melbourne have my mama & his family..So my first reason would be to see my lil cousin who is so pretty i have to meet her soon…Secondly i would be excited to beautiful landscape that is Melbourne city go & see the victorian style buildings while also enjoying beautiful gardens and sipping coffee in the famous melbourne cafes…Send time with my cousin at her favourite place Melbourne zoo and experience the "Tram Experience in real life"…it would be awesome experience for a Mumbaiite like me. Taking a roadtrip on the Great ocean road if missed then my aussie journey would be incomplete..its perfect…Travelling along this route to go for scuba diving would make my travelling experience perfect!! Wow, that's a pretty warm and hear-warming comment Nikhil! Loved it. You have so beautifully put your Melbourne itinerary together! May you get to visit this marvellous city and your little cousin soon! Ruby, a drive down the Great Ocean Road would be, I am sure, one adventure ride! And this stretch indeed has so much to offer to adventure loving souls! I can imagine the adrenaline rush already! And why just adventure, a leisurely walk along the coastline too would delight anyone! Thanks for stopping by Jhilmil! Thanks for appreciating the post. Am glad that you found it interesting and enlightening enough to wish for a Melbourne trip! And yes indeed, Melbourne is such a treasure trove that it's very difficult to pin-point or mark just a few places as 'must-see'. Every nook and corner of this marvellous city has something to entice the visitors to explore more and to reach out to grasp all that it has to offer! Great Otway National Park is a wonderful place for camping! My cousin visited the park last year and he had an exciting time exploring the flora and fauna there. There are lots of fancy birds there too! Thanks Rutavi! Glad you enjoyed the post! Melbourne indeed has lots to boast about! Dear readers, the comment contest on this post is now closed. Thank you all for participating. Thanks for appreciating the write-up, Bhawna! Am glad you enjoyed the post. And it was fun virtually exploring Melbourne to put it all here on the blog. And I see that the iconic 12 Apostles and Phillip Nature Island figures in your Melbourne wish-list too! Great choice! Thanks for stopping by Alok, and thank you so much for appreciating the post. Am glad that you found it interesting and enlightening enough to wish for a Melbourne trip! But I really like the spirit with which you have expressed your appreciation for Melbourne, the marvellous city! And this – Ragini इफ i डिडन्ट गेट चांस टू विज़िट मेलबोर्न देअर वॉन्ट बि एनी रिग्रेट .. बिकॉज़ ऑफ़ डा विविड पिक्चर यु प्रोड्यूस्ड ;-)) has left me in a laughing fit! Thank you so much for participating in the contest here. Hope you get to visit Melbourne soon, and of course with your mate! Okay dear readers, it's time to announce the winner of the Melbourne Jao Comment contest. While all your comments were lovely, Santosh summed up his wishlist in a few words – 'all or none'. And that's what won me over. And then there was his witty justification of why 'all or none'. I am sure you all will agree that his comment is fun – just what Melbourne is all about. अरररर…रे …..its Me !! How it could be ^_? without doing much बला बला n blaaa..
lastly every things revolves round a Romantic Romance in one hand and with a glass of Wine in others..